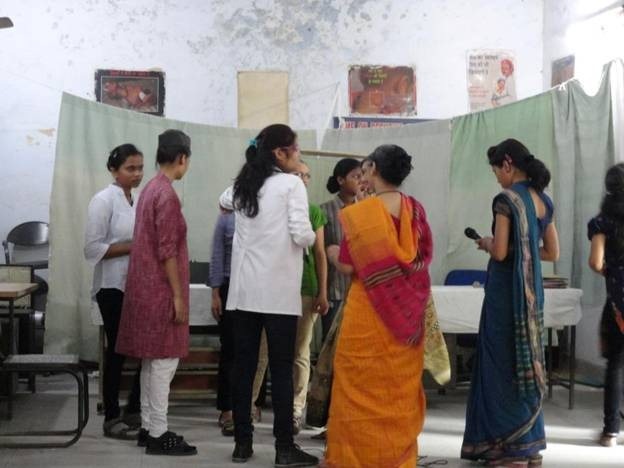 The students of the Nursing College of University College of Medical Sciences and Guru Teg Bahadur Hospital presented a power-packed performance at the Urban Health Training Center of Dallupura on the occasion of Geriatric Awareness amongst the community members on 12th October, 2012. The theme of the street-play-like performance was the story of two families with elderly members and their interactions with other family members and other social interactions. 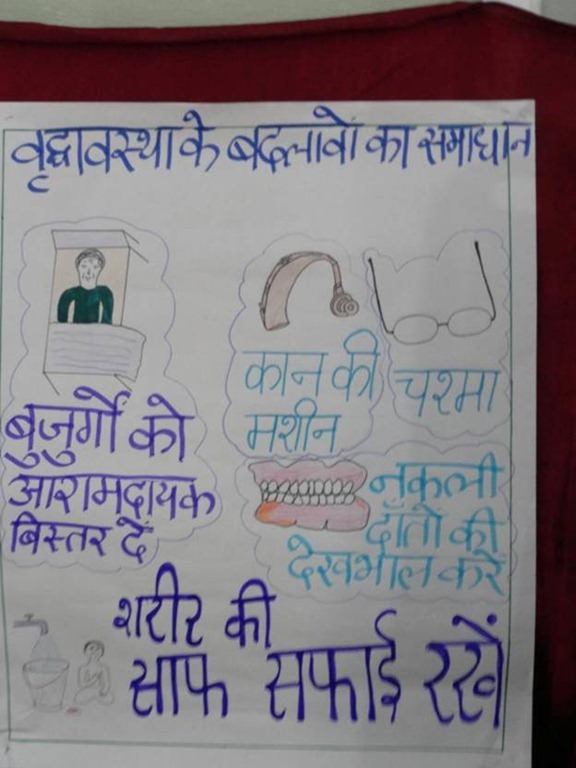 The students cleverly used common place articles as props to add to their performance and through their performance they portrayed the programs for the geriatric and elderly people developed by the Government. The audience was especially enthused when the performing students delivered the message that being above 60 years of age; they were eligible for financial support from the Government, under the existing programs for empowerment and assistance of the geriatric population. Within the means and resources available, the students had done a commendable job of providing the information they needed to send across to the audience. They talked about the common geriatric ailments, when and how to seek medical attention, Government-launched programs for dissemination of social and economic justice, and socially relevant issues. They reflected on the role of the NGOs in building capacity in meeting the growing special needs of the geriatric people in a social and legal context. They talked about the moral and social responsibilities of the youth of today to take care of and support and sustain the elderly not only in their immediate families but also in their immediate social ecosystem. They raised the issues of parent abandonment and elderly abuse meted out by the errant children and the legal ramifications of the same. In a brief show of about 30 minutes, the students battled power cuts, an audience that sometimes wondered what was going on, a clutch of noisy, playful children who wanted to be a part of the show, and of course, bouts of applause when they would portray some aspect of life the audience particularly identified with. My city-life sensibilities thought that it was an over-simplification at the outset and I was wondering whether or not one should have taken the creative liberty of adding a more complex story line, but at the end of the day, I stood corrected. The audience, who were treated to packs of biscuits and wafers after the show was done, was tremendously appreciative of the show and was looking forward to implement some of the messages that were conveyed to them. 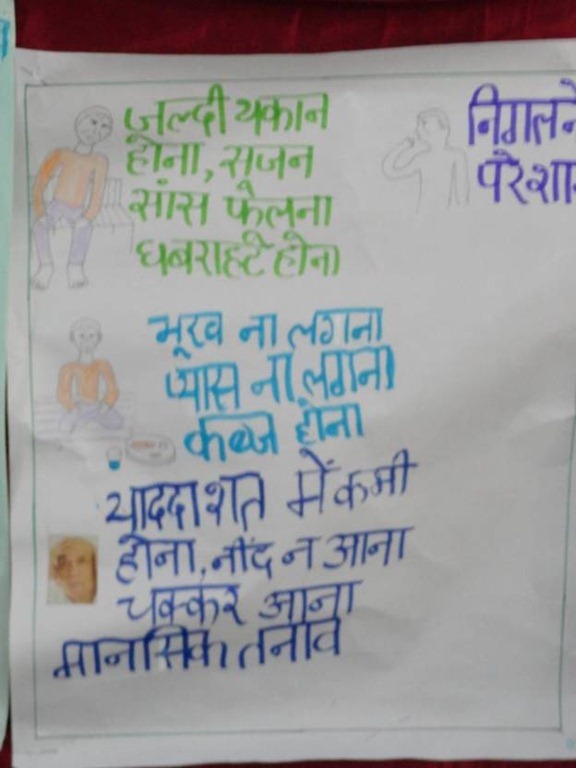 And no, this is not a personal conjecture, because in a while, when we started the OPD, we got proof of the impact of the show on the elderly audience present there. One of the old ladies, who is a frequent visitor with her grandchildren and the neighbors’ ailing kids, opened up about her headaches and it turned out that she was suffering from hypertension that she never drew attention to. A couple others were more responsive when I asked them to be more proactive about their own good health. It is a sad state of affairs that in a nation like India, where the notion of family bonds is (?was) strong and a sense of belonging to a family is, or maybe, was, a critical element of the social fabric, the elderly become the victims of neglect and abuse. This goes completely against the grain of the social and cultural tradition. This event was a reminder of the way the occidentalization of our lives was also causing such changes in our social and cultural mores. Seneca had said; “Old age is an incurable disease”. I would like to disagree with it. First, old age is not a disease. It is an inevitable state of existence that the prolongation of life and the improvement of medical care have spawned. Second, it is not supposed to be curable. It is supposed to be embraced and loved. At the risk of sounding clichéd, I must say, the goal is to add life to one’s years and not merely years to one’s life. Tags: Communication, Community Medicine, Geriatrics, Public Health. Bookmark the permalink.